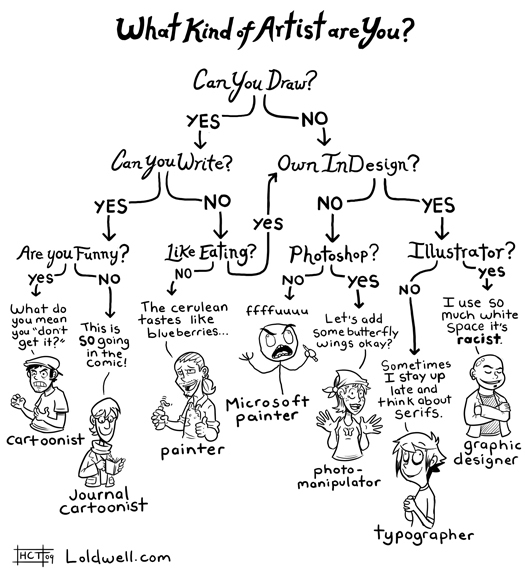 The System - What Kind of Artist Are You? Carter and Paul over at Crooked Gremlins posted this chart, claiming they are both on opposite sides of the spectrum. I’m ashamed to say where I am on it. Where are you? Btw the creator of this chart is a comic artist / illustrator / assumedly graphic designer and I spent too long looking through the archive. It’s now in not only the comics I read, but the 1st set right after lunch. High praise indeed. His site here. PS If in some way Caldwell Tanner comes across this and is in any way inclined to send me a Falcon Lunch shirt, that would be great thanks.